BRUSSELS (Reuters) - NATO allies agreed on Friday to send aircraft and ships to Turkey to strengthen Ankara's air defenses on its border with Syria, the alliance's chief said. Diplomats said the package is partly designed to avoid more shoot-downs of Russian planes. Envoys to the North Atlantic Treaty Organization approved the plan and must now decide what military assets to send to Turkey, NATO Secretary-General Jens Stoltenberg told Reuters, stressing that it was a defensive measure. "We have agreed on a package of assurance measures for Turkey in view of the volatile situation in the region," Stoltenberg said, although he avoided any reference to Russia's military involvement in Syria and its air incursions. Given that Turkey already has a formidable air force, NATO diplomats and military experts say the alliance's involvement is to minimize the risk of any repeat of Turkey's Nov. 24 shooting down of a Russian warplane that flew into Turkish airspace. That was the first known incident of its kind since the Cold War and the most serious of several air incursions since early October, leaving relations between Turkey and Russia at their lowest ebb in recent memory. Moscow has retaliated with sanctions and called it a "hostile act". Due to be assembled in the coming weeks, the package will include NATO's AWACS surveillance planes and what Stoltenberg described as "enhanced air policing, and increased naval presence including maritime patrol aircraft." The ships will be provided by Germany and Denmark, which are exercising in the eastern Mediterranean. AWACS monitor airspace within a radius of more than 400 km (250 miles) and exchange information via digital data links, with ground-based, sea-based and airborne commanders. Asked if this was about managing Turkey's airspace with more caution than Ankara has shown in the past, Stoltenberg said: "This will give us a better situational awareness ... more transparency, more predictability and that will contribute to stabilizing the situation in the region and also calm tensions," Stoltenberg said. Spain has also agreed to extend its Patriot surface-to-air missiles along Turkey's border to shoot down any missiles from Syria's conflict fired into Turkish territory. Germany and the United States recently removed their batteries from the area. 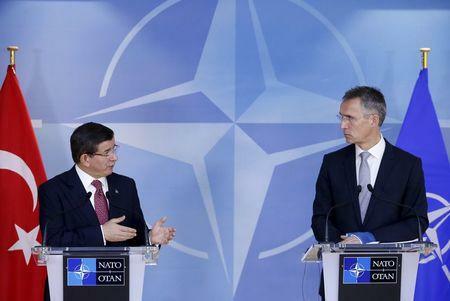 NATO diplomats worry Ankara is too aggressive and that further incidents could escalate the situation after Russia moved its modern S-400 air defense system into Syria that can hit missiles and aircraft from up to 400 km. It has also upgraded its strike aircraft with SU-34 fighters. While NATO allies do not dispute Ankara's version of the facts, they also are keen to engage Russia in talks to avoid incidents that could flare from Moscow's aggressive patrolling of alliance air borders around Turkey, the Baltic states and the North Sea. "We are concerned about the military build-up in the region," Stoltenberg said, and said he hoped NATO could repeat the same kind of air policing done in the Baltics, "without incidents and accidents".